I know Scotland well, now having lived here for the past few years. So having stayed here and hearing about the West Highland Way and how it's considered one of the best long distance hikes in Britain, I thought I should take advantage of my current location and plan a trek along this world famous route. Wow, was I in for a treat. It then occurred to me, that my good friend John works with Scotland's Wild, they specialises in organising outdoor adventure for visitors to Scotland. I should have thought about them straight away! They took all the drama and stress out of booking my West Highland Way trip….but left all of the drama of seeing it right where it was! Scotland's Wild really did put my mind at rest. They planned it, so I didn't have to. Calling on years of experience living and working in the area, they knew intimately the routes, took into consideration my level experience (or lack of) explained how realistic is was for me to do them in certain periods of time, and even made recommendations which altered the itinerary but made the overall experience so much more memorable. The one thing Scotland’s Wild can’t guarantee is the weather, but even then I’d like to think they arranged with God himself, for the suitably dry, warm week I experienced. Setting off in early May, it was recommended to me as a perfect time to embark, the weather is traditionally better (it 100% was for me :)) there are less midges active and the beautiful spring colours are starting to blossom. John found me some great comfortable and cosy accommodation at a variety of Bed and Breakfasts, small hotels and as I'm the outdoors and adventures type, camping spots along the route. It really isn’t a route for the faint-hearted, but it is one which can be conquered at any pace and at any time of year, with a little help and planning along the way. Scotland’s Wild was able to sort out the intricacies of my baggage service, which collects all your equipment each morning and drops them off up at your next expected stop. Of course, however, making it to these locations was up to me. Soon into my rhythm on day one, the softly undulating first section of the walk led me toward the village of Drymen for my first night's stay. On my way there though, Scotland's Wild had given me a map and recommended I stop at the local whisky distillery for a well-deserved tour and of course and dram of the delicious "water of life". It's fair to say, I took them up on that recommendation. I continued along the lovely scenic lowlands before arriving for my first evening's accommodation in the charming little village of Drymen. Scotland's Wild had reserved a table at Scotland's oldest licensed pub, the Clachan Inn for that evening. What a treat that was! Traditional Scottish cuisine of Haggis, washed down with a local Scottish Beer in a pub from 1734 really was the best way of ending my first day on the West Highland Way. After a snug night sleep in Drymen, I continued on through some beautiful forestry to the highland boundary fault line at Conic Hill, the first considerable climb. This is where Scotland's lowlands and highlands meet. This is a must see view for all who are doing the West highland Way and you can bask right here and reminisce as you enjoy the views over Loch Lomond and her islands. You'll be safe in the knowledge your bags will be waiting for you just a few miles later at Rowardennan, along with a comfy bed. There’s a real sense of community to the Way, tourists from all over the world, all making their way along the west highlands. You’ll no doubt strike up conversation with some, comparing stories and notes about your hike. It felt like there was an imaginary race at some points, I'd pass a fellow walker, stop for a drink, take in the view and then they'd pass me 5 minutes later. This kept happening for the entire way and made for some good comradery. From here came the section hugging Loch Lomond itself, winding its way north. This really is a beautiful walking route, sometimes flat along the lake, sometimes hilly and off into the woods. All of it has a majestic feeling of nature at its best. As you start to leave the road behind you, you continue on into the hills, which make you feel more remote. Some suitable stopping points for refreshments do await, but they become less and less regular the further north you hike. I was in the heart of Scotland, and in the heart of its first national park, when I became increasingly aware that I really was in a wild and remote area. Memories will be made here that will last you a life time. After a few hours of hiking, you'll be glad of a rest, to recharge your batteries, and there are many stunning locations to do this. Inversnaid is one of those spots. It's a fantastic location to just marvel across the water at the various peaks of the Arrochar Alps to your west which I certainly did, accompanied by a refreshing Scottish Beer. Sadly, by the end of day 3, I had to leave Loch Lomond behind, saying farewell to the Loch at a magnificent view point looking south, down toward Ardleish (perhaps my favourite view in the entire national park and of the entire West Highland Way). I just sat there a while and took in the grand scenery in front of me and appreciated all that I had seen and accomplished so far, it truly was a fantastic feeling. On I marched to the modern campsite of Beinglas, before making my way to the historic hotel of the Drovers inn for a fantastic meal, pint or two of the local Beer and a great night's sleep. The next day I continued my walk north, through Glen Falloch where it becomes wide expanses of land opening out to offer up views of the grand country beyond. Remnants of beautiful ancient Scots pine dot the route. Through farmland and over rivers, you’ll be immersed in countryside walking. I even passed a historic site where the famous King Robert the Bruce lost a battle to the MacDougall's of Lorne. I thought about looking for swords which may or may not be in one of the small Lochs there, but came to my senses and decided it was too cold for that. Off I continued instead to the gateway of the highlands in the lovely village of Tyndrum. After the a great nights rest in Tyndrum, where they've recently opened Scotland's only gold mine, I was ready for the challenge of my longest and day of 20 miles (32 km's) I arrived at some stunning open countryside and eventually found the charming Bridge of Orchy. Push on, a further 2.5 miles over another forest and hillside to Inveroran, for the friendliest and most wonderful meal at a lovely remote hotel. I can’t rave about this little place enough. Everything about it, the hospitality, food, staff, remote location by Loch Tulla (spot it below), was wonderful and one of the best places I've ever encountered for a relaxing lunch with a view. Fortified by replenishing my hungry belly, I made my way toward Rannoch Moor, the biggest uninhabited wilderness in Britain, scattered with Lochs, rivers, burns, rock formations and patchwork landscape. On this sunniest of May days, barely a cloud in the sky, barely another walker in sight it was quite possible to imagine, at least for a little while, I was the only person on earth. It's a landscape that needs to be walked to be believed. It was the same again only a little while later at Glencoe. It was hard to grasp the scale, the sheer impressiveness of the mountains and landscape around here. Sure, a main road cuts through the middle, but that is but a murmur of noise and activity amid an overwhelming sense of nature and awe at the natural world. The sleep I enjoyed in Glencoe after a 20 mile day (32 km's), more than 70 miles total and 5 days of hiking was as wonderful as the scenery in the highlands itself. I think my body needed it. That morning I set of from the Kingshouse hotel and soon cut up the Devil’s Staircase, the two words which always strike the most fear in West Highland Way walkers I’ve previously spoken to. Let’s be honest, it sounds brutal, but it’s just another climb. The walk down, long and grueling, into Kinlochleven, was tiresome but worth it for the arrival in a lovely hamlet between the mountains. 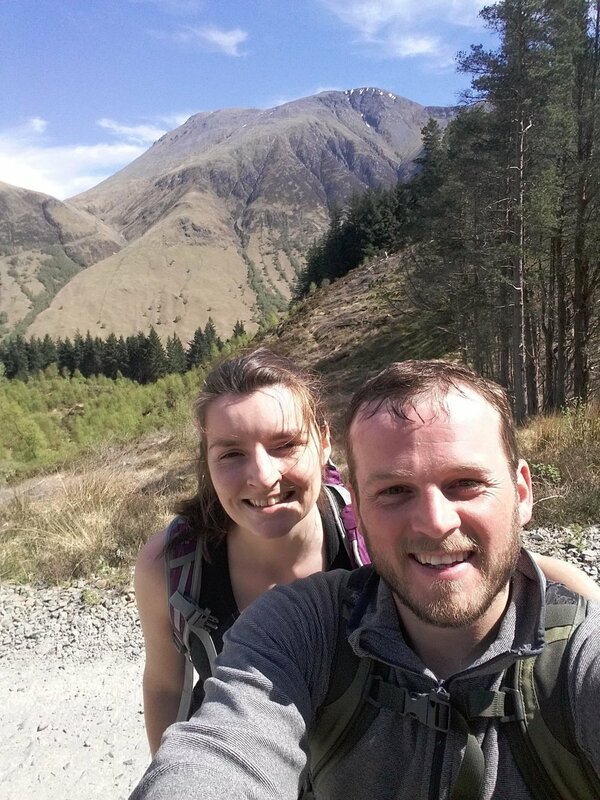 Kinlochleven used to be famous for their aluminium smelting, though now they survive mainly on West Highland Way walkers. Due to this, there are some beautiful restaurants to suite all budgets. My final day! I was happy to be nearing the end, though that happiness was outweighed by the sadness that I was feeling. This was after-all my last day hiking through all this glorious highland scenery. 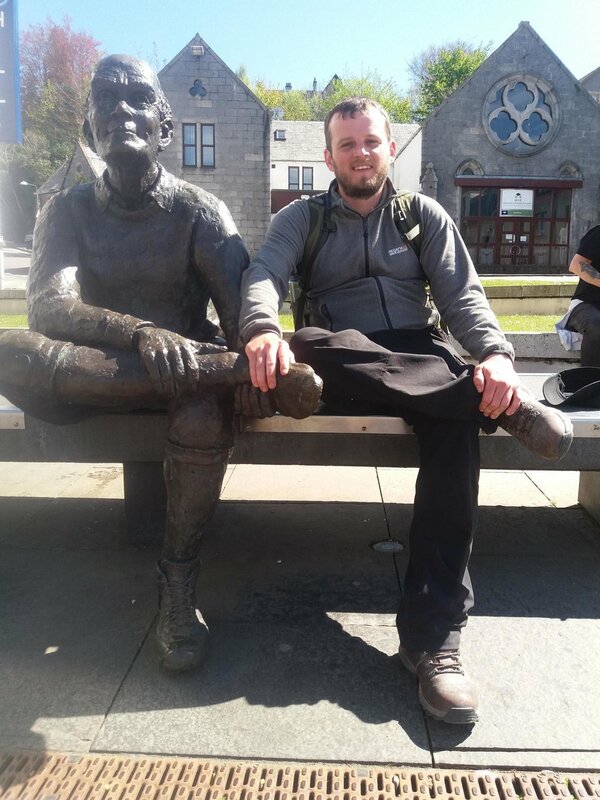 I had 16 miles (26 km's) to Fort William, and I was going to saver and appreciate every footstep until I reached there. I began with climbing back out the other side of the vast valley I walked down into yesterday. Other hikers and I remain in high spirits, perhaps fortified by the knowledge there’s no longer too far to go. Eventually Ben Nevis, the tallest peak in Britain, comes into view. I’ve now walked from just outside Scotland’s largest city all the way to in sight of its biggest mountain. The grandeur takes you back somewhat. It's a moment to reflect on the progress made, the effort and challenge undertaken, perhaps just the time to try and get the right sort of selfie. Arriving down the hill into Fort William I felt a great sense of pride at having finished. I had a camera full of amazing photographs, a head full of wonderful memories and a sense of achievement knowing I've just completed the 96 miles or to make it sound more impressive, 154 Kilometres of the most breathtaking landscape on one of the most amazing long distance treks in Britain. I'd just love to say a massive thank you to Scotland's Wild for making my hike possible. All opinions are my own and the reason I wrote this post for them is due to the great service my friend John and the company Scotland's Wild provided for me. I chose to do their 7 day and 8 nights Self-Guided option as I felt I was fit enough, as I'm an outdoorsy type of guy. Though, if you feel like you really want to do it quickly as more of a challenge, then there are options to hike it over 5 days or 6 days. Or if you want to relax and really take in the scenery at a more leisurely pace, then there are options to do it over 8, 9, 10 or even more days. If you fancy a truly unique and personalised hike and would like to learn about Scotland as you travel, then they also do a fully guided and Private Tour. Whatever one you choose, I'm sure you will love it.